I absolutely love the new App Nap feature in OS X Mavericks. It makes my 2012 11-inch MacBook Air run even faster, and having better battery life. App Nap helps you save power when you’re working with multiple apps at the same time. OS X can tell when an app is completely hidden behind other windows, or if you do like me, having every app in fullscreen on their own space (desktop). 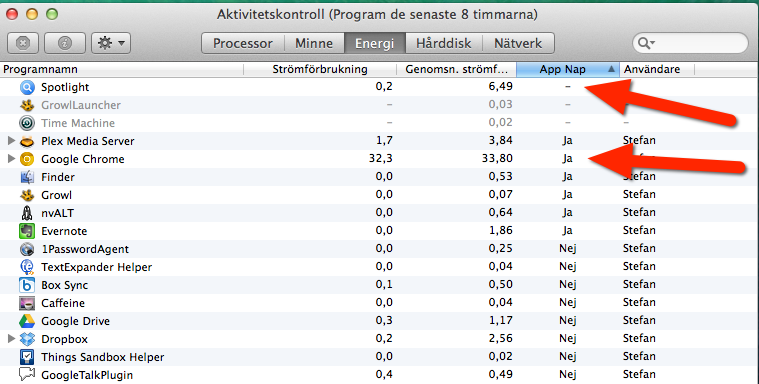 Then App Nap conserves valuable battery life by slowing the apps you don’t use at the moment down. But as soon as you start to use it again, the app instantly shifts back to full speed. It all works totally automatically and you don’t even notice that the apps has been asleep, they wake up so fast. With App Nap, CPU energy use can be reduced by up to 23 percent. OS X Mavericks simply transfers disk and processor priority to the foreground app, improving the responsiveness of the system. And you really can notice that. A quite big difference. App Nap is also more aggressive when running on battery, and you can really feel the power of the app you are using at the moment. Love it.